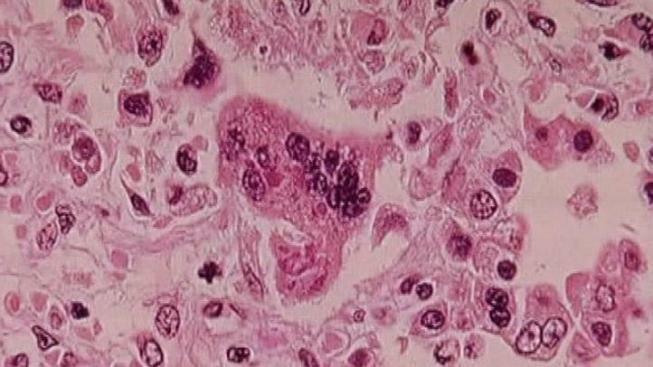 Measles virus, pictured here, has been found in Ventura County, health officials announced July 19, 2013. A confirmed case of measles in Ventura County has health officials emphasizing the importance of immunization against the highly contagious disease that has been mostly eradicated in the U.S.
A European tourist is confirmed to have the disease, the Ventura County Public Health Care Agency said Friday. Another tourist, also from Europe, is suspected of having the disease. Symptoms of measles include fever, runny nose, cough, red eyes and a rash all over the body. Measles is spread through the air by breathing, coughing or sneezing. It is so contagious that any child exposed to the virus who is not immune will likely contract the disease, according to the Centers for Disease Control and Prevention (CDC). Because the virus is so easily spread, anyone with measles-like symptoms should call their doctor’s office or clinic before visiting in person so they can be separated from other patients, health officials say. Measles was declared eliminated from the U.S. in 2000, according to the CDC. About 60 cases of measles are reported yearly in the country. But in 2011, the number of reported cases was higher than usual at 222. Of those patients, nearly 40 percent contracted the virus in other countries. Worldwide, there are about 20 million cases and 164,000 deaths from measles every year. More than half of those deaths occur in India, according to the national health agency. Children should get two doses of a vaccine that protects against measles, mumps and rubella, also known as MRR, the CDC recommends. The first dose is administered between the ages of 12 and 15 months; the second dose is given between ages 4 and 6. Anyone who needs an MMR vaccine is asked to call the Ventura County Public Health Care Agency at 805-981-5221 or 888-285-5012.